Recently business and financial guru Mark Cuban wrote an article about why this tech bubble is going to be worse than the tech bubble of 2000. This made me take another look at the long term charts again, but instead of looking up the NASDAQ or the tech sector I decided to check out gold mining stocks, gold price and the Dollar index. From looking at the price action among the precious metals sector and the dollar it looks and feels like these markets are very close to repeating what happened in the year 2000. The chart below is a monthly chart looking all the way back to 1996. I have color coded areas of the chart that represent weak and strong times for the price of gold. The US Dollar is trading roughly at the same level and trending higher as it was in 2000. 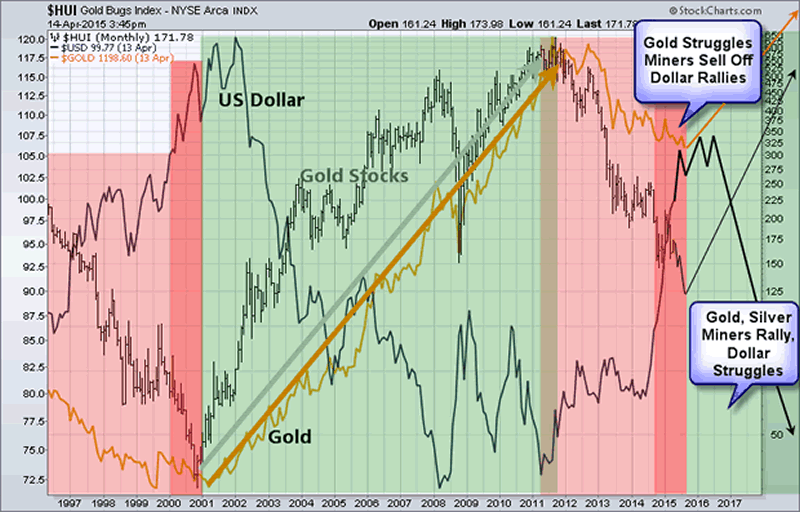 Rising dollar is neutral/negative on commodity prices and resource stocks like gold miners. Gold price struggled as the dollar rose in value. Gold stocks fell sharply during the last year of their bear market. Gold stocks bottomed before physical gold by several months. In short, I feel most of the downside damage has already been done to the price of gold. Gold stocks on the other hand could still get roughed up for a few more months before finding a bottom. Money is likely to continue rolling into the dollar as a safe haven and this will keep gold and silver prices relatively flat. But once the dollar starts to show signs of increased volatility (top) similar to 2000 - 2001 money will find its way into other currencies and precious metals as the new trade and safe haven.